From time to time, I love sharing a recipe I’ve been making organically in my kitchen and enjoying on a regular basis. This smoothie is one of those recipes. It all started with an obsession for banana and peanut butter, which goes way back to my favorite green smoothie. Since then, my taste has become slightly more sophisticated and I’ve been enjoying more adaptogen and green powders in my smoothies for an extra boost of nutrition. 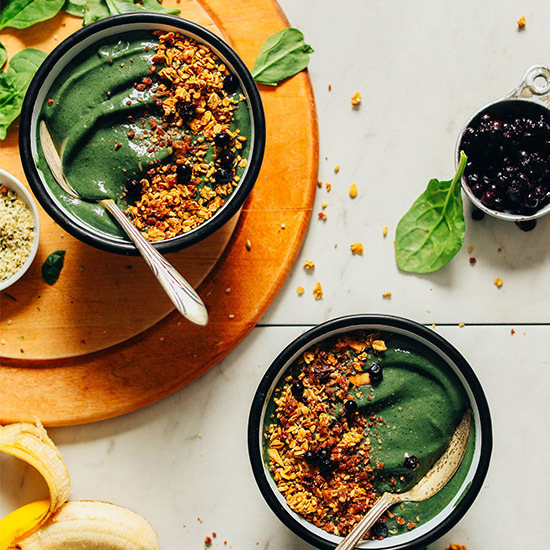 We hope you love this smoothie bowl. 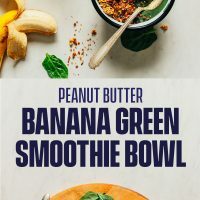 It’s perfect for all you peanut butter banana lovers out there who also love a healthy dose of greens. The recipe happens in your blender in about 5 minutes. Banana is blended with cauliflower and blueberries for a creamy, perfectly sweet base. 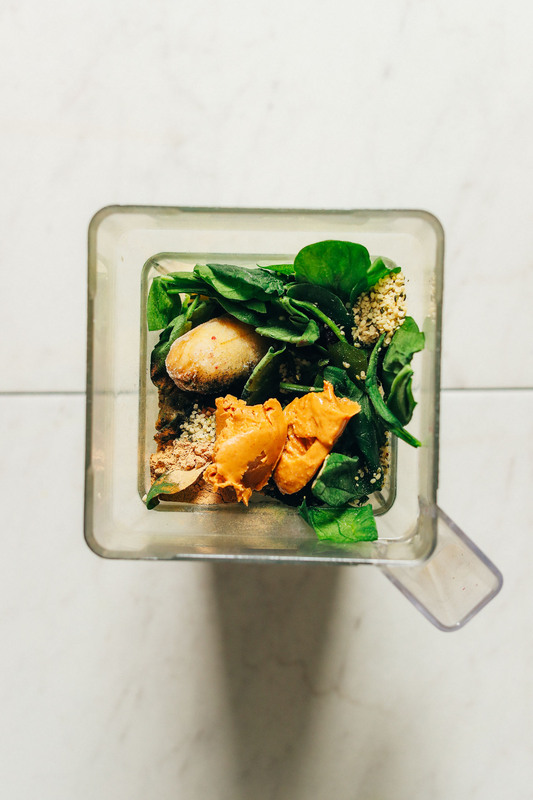 Then add in a big handful of greens, a healthy dose of peanut (or your favorite nut/seed) butter for saltiness and protein, and dairy-free milk. For a little extra nutrition, we added hemp seeds for healthy fats and protein, spirulina for detoxification, maca to help balance hormones, and ashwagandha to help the body adapt to stress. Not to worry, these add-ins don’t really affect the flavor because the banana and peanut butter combo still shine through (phew). This would make the perfect snack or breakfast, especially during warmer months. It’s light and refreshing yet totally satisfying. Top yours off with a little granola for even more staying power. 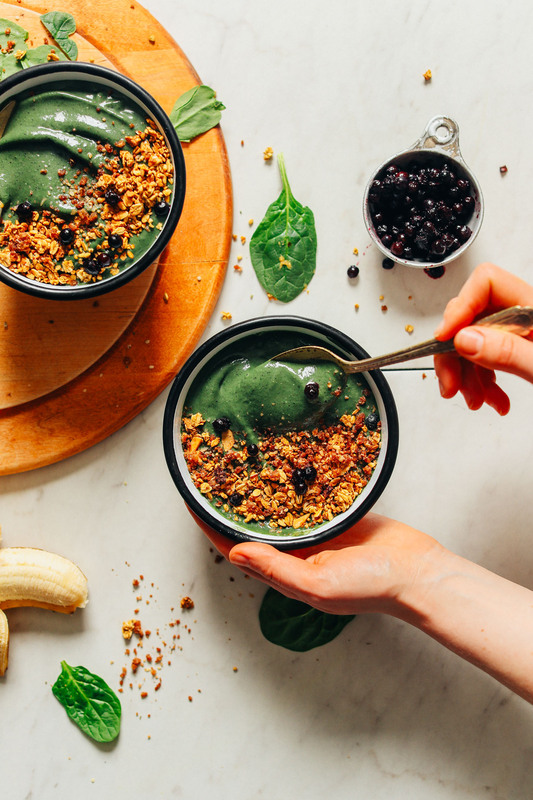 Be sure to check out our other smoothie bowls: Matcha Green Smoothie Bowl, Super Green Smoothie Bowl, Go-To Berry Smoothie Bowl, and Peanut Butter & Jelly Açaí Bowls! If you try this recipe, be sure to let us know in the comments. And don’t forget to tag a photo #minimalistbaker on Instagram! We’d love to see what you come up with. Cheers, friends! 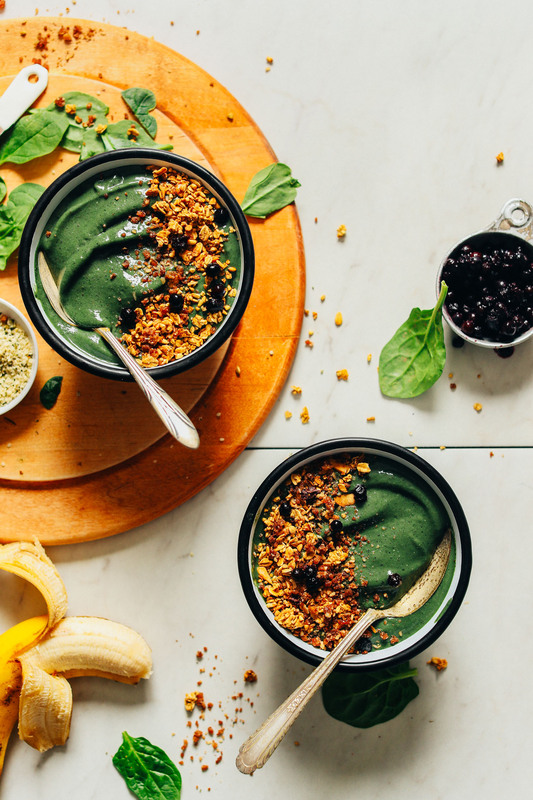 A 5-minute creamy green smoothie bowl infused with banana and peanut butter! Packed with vitamin- and nutrient-rich ingredients. The perfect marriage of savory and sweet in a healthy breakfast or snack. 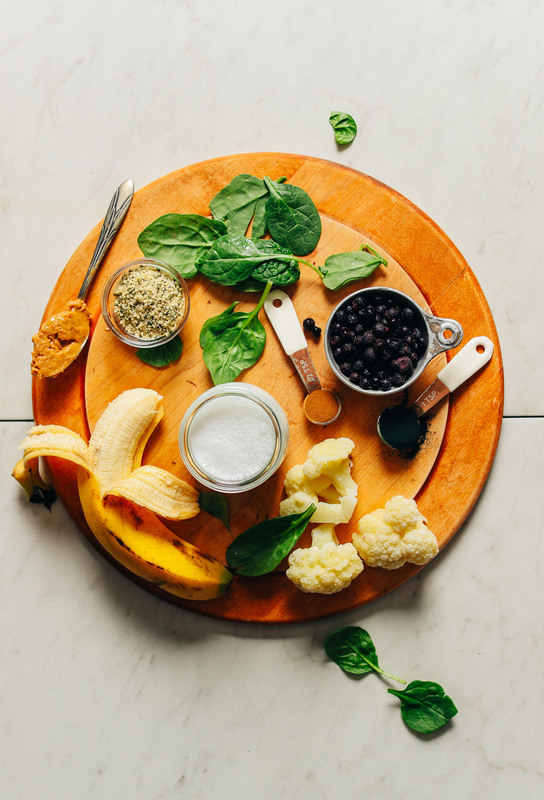 Add all the ingredients (bananas, blueberries, spinach, cauliflower, dairy-free milk, maca, ashwagandha, spirulina, hemp seeds, and peanut butter) to a high-speed blender. Add a little bit more coconut milk in small increments until creamy and smooth. For a thicker smoothie bowl, add less milk. For a thinner smoothie bowl, add more milk. Taste flavor and adjust if desired, adding more peanut butter for saltiness or banana for sweetness. Spirulina or more spinach will add a deeper green hue. Divide between serving bowls and garnish with toppings of choice. We went with oil-free granola, rawnola, and more frozen blueberries. Best when fresh. Store leftovers in the refrigerator up to 3 days. Freeze into ice cubes for longer-term storage (~1 month) and add to future smoothies. *Nutrition information is a rough estimate calculated without serving ingredients. I just tried a modified version of this recipe for lunch (I needed something healthy and quick). I didn’t have any cauliflower so I left that out but I probably should have reduced the almond milk as it was a little runny, I also didn’t have spinach or any of the powders so switched in fresh kale that I had in the fridge. I had some frozen ginger so added that in (I wouldn’t recommend it!) It was actually really good, as someone else commented it wasn’t a pretty green like yours, more like a sludgy purple but I topped it with some sliced almonds and granola which added a nice crunch. I’d definitely try this again (once I have all the correct ingredients). Tried this recipe for breakfast. Didn’t have Spirulina on hand so left it out. I’m not a fan of cauliflower and could definitely taste the cauliflower in there. It smells like cauliflower too (yuck!). However, I’m glad to get so many healthy ingredients (that I otherwise wouldn’t be able to get down) in me through a smoothie. For being so healthy, the smoothie isn’t half bad. LOVE this recipe, make it at least twice a week. So easy and delicious, I usually top with toasted nuts and seeds, but it’s so good, sometimes I just eat it plain. Whoop! Glad to hear you enjoy it, Geraldine! This was great! I didn’t know if the banana and peanut butter flavor would still shine through but it did. I thought the cauliflower might be weird but I couldn’t even taste it and it added a great texture. I loved this! This is so FRIGGIN good! Just made it this morning and I am in love. Thank you so much for sharing this!!!! This is great but mine turned out purple! My toddler (3) loves smoothie bowls for breakfast, is it safe for her to drink the maca and ashwagandha powder? Hi! We always recommend checking with your family doctor first! Wonderful recipe! I actually like using half a teaspoon of spirulina for making two green smoothies and for baking in general. Spirulina just has an extremely pungent flavor that I personally don’t find pleasant, but it is wonderful for its health benefits and color yield! love this smoothie! i make pretty much the same one every day! your recipes are always fab. Yum! I love a green smoothie. I haven’t heard of ashwagandha, will have to track it down. I avoid using hemp seeds in smoothies, cos I find they never blend well and I have little bits in the smoothie. Any tips? Feel free to leave them out! Yay! Welcome to the site, Kelly :D We’re glad you enjoyed this recipe! I wish I could eat more Vit K foods but taking coumadin for my pulmonary embolisms last summer I can’t. I have to keep changing the dose when I eat greens for a long period of time! Hi Pamela. Spirulina has pretty reasonable vitamin K levels, so you could just skip the greens on this one but still add spirulina for lower vitamin K content. Hope that helps! Hi Robin! What about almond or cashew butter? Or even seed butter, such as sunflower? Hi Robin! What about almond or cashew butter? Or even seed butter, such as sunflower? That sounds great, thanks for the response and so fast. There is not a better combo than peanut butter and bananas and it is only better in smoothie form! Will need to give this a try. Thanks for sharing it! Yum!! Looks great. I’ve made your smoothies before and they have never failed me. Also love how we can show the recipe per servings… changing it from Serves 2 to Serves 1… very clever! Where do you get your add-ins? What brands are they?? There are so many options out there, it’s overwhelming. I just added links to all the add-ins, so you’ll be able to find the brands we like! For adaptogens you can also trust the brand Sun Potion. They’re pretty great and I like their ashwagandha a lot. Great! Thank you so much!